Pregnant Amal throws George surprise birthday bash! Amal Clooney proved she's still head-over-heels for her handsome hubby George Clooney by throwing him a surprise birthday party! But the human-rights lawyer, who's heavily preggers with their twins, had some help from close pals, Rande Gerber and Cindy Crawford, who flew into London from Los Angeles to give a helping hand. George turned 56 on 6 May. "Amal set it all up, and Rande and Cindy surprised George when he got home," a source told E!Online. When George pulled into his driveway, Rande "came from around the bushes driving George's lawnmower and pulled up beside George's car while Cindy was nearby in the garden cutting fresh flowers. George was totally surprised!" Instagram-loving Rande, who owns a tequila business Casamigos Tequila with George, shared some fun snapshots from the day, as neither Amal or George did. Only "close friends" were invited to to the bash with Amal (39) creating a cake replicating the Casamigos Tequila bar from George and Rande's holiday homes in Mexico. "Amal set it all up and Rande and Cindy surprised George when he got home," the source says. Rande also teased his pal, by sharing a throwback pic of George giving his best modeling pose. "The modeling thing may not have worked out, but @casamigos sure did," he joked. "Happy Birthday George!" The modeling thing may not have worked out, but @casamigos sure did. Happy Birthday George! Fellow actor Salma Hayek also tweeted out a throwback photo of the two of them alongside fellow actor Will Smith. "Happy Birthday George! Feliz Cumpleaños Jorge! #georgeclooney," she wrote. 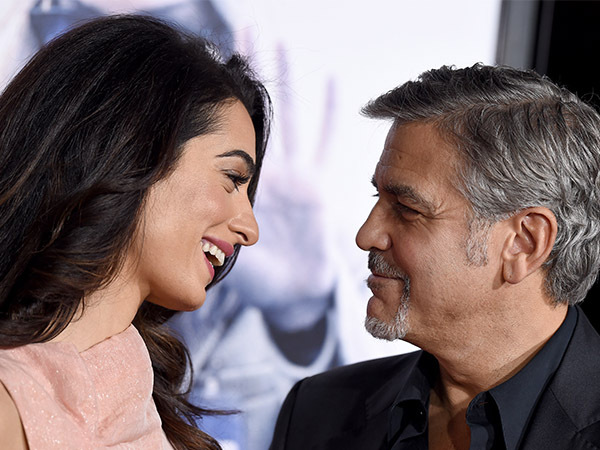 Amal and George are currently counting down the days to the arrival of their twins. "Amal is due any day now. They're just waiting at this point," a source tells E! News. "Technically her due date is next month, but they expect the twins to come early. It's just a waiting game now."